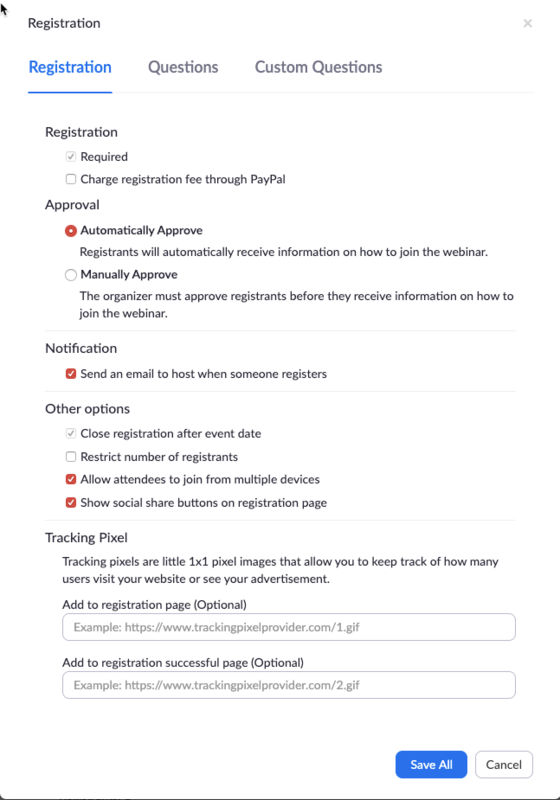 You can customize the registration process for webinars, including approving attendees, enabling email notifications for registrations, and adding registration questions. You can also customize the look of your registration page with Webinar Registration Branding or track traffic to your registration page by setting up Webinar Registration Source Tracking. Registration tab: Automatically or manually approve attendees; and enable email notifications for attendee registrations. Questions tab: Choose from a predefined set of questions to add to attendee registration. Custom Questions tab: Add custom questions to attendee registration. Log in to your Zoom Web Portal and navigate to My Webinars. Click the topic of the webinar that you want to customize. Scroll down to the Invitations tab. In the Approval section, click Edit. 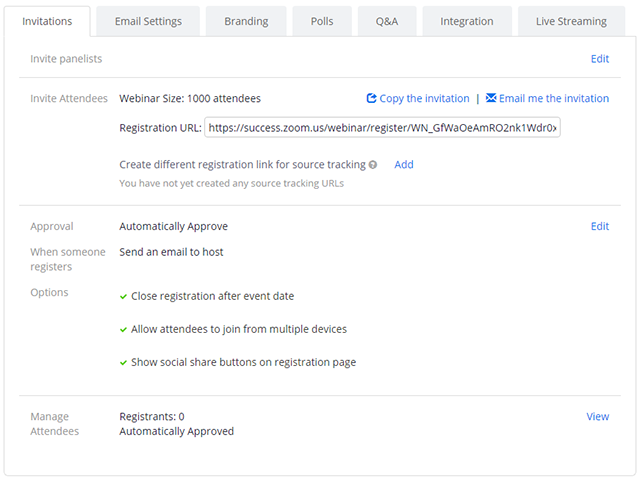 Under Registration, uncheck Required to allow attendees to join by entering their name and email address when they visit the webinar URL. Check it to enable Registration which requires attendees to fill out a form before they can join the webinar. Automatically Approve: Users will have to register for the Webinar in advance and will be given options to join directly after. The host can deny attendees after they have registered. Manually Approve: Users will have to register for the webinar in advance and will only be given options to join after the host approves their registration. Send an email to host when someone registers: Check this option if you want to receive an email when someone registers for your webinar. Attendees will receive an email when you approve their registration. Close registration after event date: Check this option if you want to prevent anyone from registering after the webinar date and projected end time. Attendees can still register on the event date and once the webinar starts, as long as it is before the projected end time of the webinar. For example, if you schedule a webinar for 9AM with a duration of 2 hours, the registration will close at 11AM. Allow attendees to join from multiple devices: Check this option to allow webinar attendees to be able to join from multiple devices, such as from their computer and phone. Show social share buttons on registration page: Check this to show Facebook, Twitter, LinkedIn, and email share buttons on your registration page for easy sharing. Navigate to the Questions tab and check the Field(s) you would like to include on your registration page. Check the Required box if you want to make that field required (users cannot submit the registration unless the field is filled). Name and email address are always required. 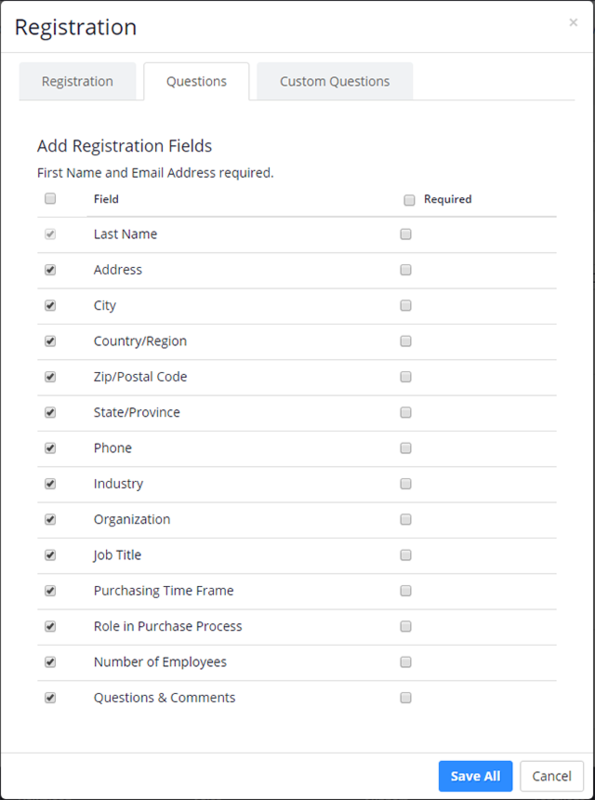 Some fields like Country/Region and State/Province will appear as dropdown menus to attendees. 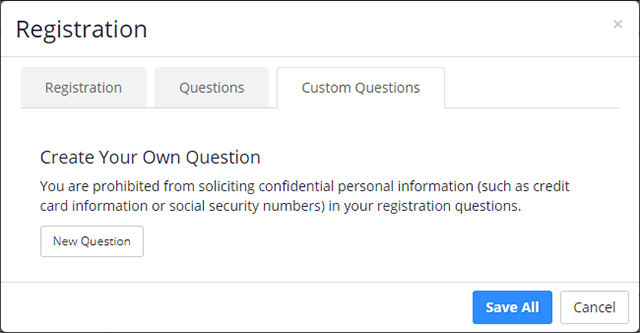 Click the Custom Questions tab to add questions to your registration page. Click New Question to add a question. Choose the type of question: Short answer, Single answer, or Multiple answer question. Check whether the question is required. For single answer or multiple answer questions, enter the answer options. Click Create. Repeat the above steps to create more custom questions. Click Save All to save your customized registration.